I am seething with anger and disgust when Imelda is reported of wishing to have another Marcos in Malacañang. At the outset I must say that I did not vote for Noynoy Aquino lest I be accused of being a pro-administration nor did I vote for Bongbong because I completely detest political dynasties. What prompted me to write this is to correct the many misinformation about the dictator and his so-called “achievements” that are currently spreading in various social media. I do remember that years ago, a conference was held and attended by top Marcos technocrats. They were the brightest economists of the land; they served the Marcos think-tank Philippine Center for Economic Development (PCED) at the state university. Under the program of developmentalism in the 1970s and later neoliberal economics in the early 1980s that became the overall strategy and template of their economic prescriptions, they miserably failed as the Philippines lagged behind its neighbors. I was one among the audience turning uncomfortable with how these co-opted intellectuals were assessing in positive light the things that happened during that thieving period. Now, social media have resurrected what I feared then as the political resurrection of the Marcoses with the spread of lies and deceptions so that those who knew must be able to counteract. I kept on receiving such and they are endorsed by those whom I thought are well-discerning. I was mistaken. For example, one declares that the late dictator, Ferdinand E. Marcos, was the best president the country has ever had. If he was the greatest thief, why was Imelda able to parry off hundreds of cases filed against her family. When he delivers speeches, he speaks extemporaneously without any notes at all. He built so many infrastructures: bridges, roads, power plants etc. During his time, the propaganda piece argues in a mixture of mangled English and Tagalog, the country was second to Japan. It is not lost to me the motive of glorifying Marcos at the expense of other administrations including the incumbent one. The brains of this massive propaganda campaign has thought ingeniously that by sloganeering that Marcoses are better than the Aquinos, their arch-rival in politics, given the numerous lapses of the present one, they can win over the undecided electorate and thus reclaim Malacañang. By pitting the Marcoses against the Aquinos they think they could influence the outcome of the presidential race come 2016 so that Bongbong could up the ante for his ambition, perhaps, wanting to outfox Binay to contend with Mar Roxas of the Liberal Party, who has very little chance to win unless they rig the election. Marcos was not, of course, the best president; he was the worst. On the question why the cases against the Marcoses were dismissed, it does not mean they were not guilty at all. It hints at how perverse our justice system is. They can hire very good lawyers while Philippine prosecutors are either plain stupid or had sold the case to the other side. Also, the judges handling the cases cannot escape suspicion of collusion. Remember that justice in the country is sold to the highest bidder. Anybody can do extemporaneous speeches with proper training and coaching. 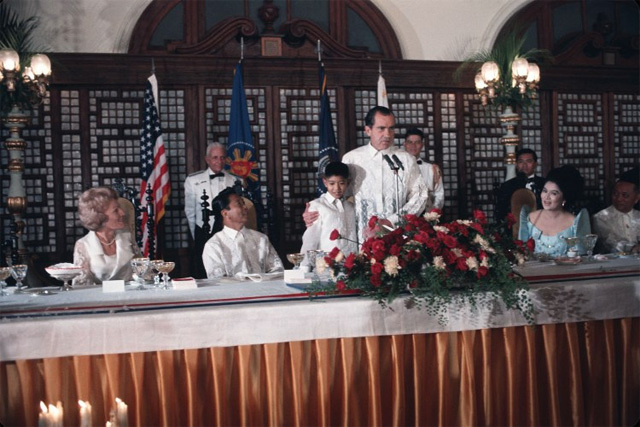 A 20-year rule from 30 December 1965 to 25 February 1986 allowed Marcos to build through that stretch of time infrastructures that to a susceptible mind would say “many,” when in fact they were only as ordinary as it could be as the average expenditures spent by previous or later administrations. It was not during his time that the Philippines was second to Japan; it was during the time of his predecessors in the 1950s. In terms of GDP, the Philippines before 1965 was ranked 19th in the world but by the end of his regime it ranked 40th following South Korea at 19th, Indonesia 24th and Thailand 33rd. It was not only the young that have become the target of obnoxious propaganda. Even those who should know better are party to this shameful revisionism. Forced amnesia had reached the national commission promoting historical research and awareness. I was talking to a member of an inutile local historical commission and then came this commissioner who was all the while a Marcos loyalist. She went to the extent of telling us that she was invited by the Commission on Human Rights and their plan to set up a museum documenting the human rights abuses committed during Martial Law after the Department of National Defense (DND) turned over sets of documents detailing the participation of the Philippine military in the torture, killing and other abuses committed during that brutal period. She was proud that she stalled the plan waxing on the need for reconciliation because she seemed to confuse vindictiveness with the urgency to memorialize. I was utterly stunned at her position that I could not find the words to talk back and refute her. There must be no reconciliation with the Marcoses if they keep on denying that they committed human rights abuses or that they amassed ill-gotten wealth. Reconciliation will happen only if they admit their culpability, apologize and make amends to the Filipino people. Do they intend to do that when they think of elections as a way of denying their responsibility for their sordid past? Twenty years of the Marcoses in power had caused untold economic desolation and moral degeneration to our nation and people. Shall we have them forever?